The tumor was growing, and the family of cancer patient Xia Jianqing was growing desperate. Doctors at a military hospital in Beijing had warned Xia's family that he would die without the blood needed for a lifesaving operation. But the hospital had no blood to spare, forcing the family out of desperation to shop for blood on the street. The patient's sister, Xia Guoqing, said they turned to one of the many criminals who roam Beijing hospitals, the local Red Cross of China Blood Center and even city streets offering bags of blood. The family paid more than 10,000 yuan, she said, and doctors performed the operation. There was nothing unique about the Xia family's early 2012 experience. Serious blood shortages at hospitals across the country have been pushing patients and their families to buy from illegal sellers every day since at least early 2011. "Many relatives of patients who need blood for an operation have no choice but to come to us," said a seller who declined to be named standing outside the Red Cross center in Beijing. Police have cracked down on the underground trade over the past year, arresting increasing numbers of "blood hawkers" in Beijing, Guangzhou, Wuhan and other cities. Five hawkers were separately convicted of organized crime charges and illegal blood trafficking during the first six months of 2012 in Beijing's Haidian District Court. And in July, in the largest blood-related trial of the year, the Haidian procuratorate indicted 12 people on similar charges, including men named Wang Haitao and Xue Shengkai whose customers several months earlier had included the Xias. Authorities say some members of the Wang-Xue gang regularly solicited customers inside hospitals. Others scoured streets and the Internet for people willing to sell blood. Their arrests, which could lead to sentences of up to five years in jail, shut down the business. But as long as blood is in short supply and desperate patients are willing, officials say, the illegal trade is likely to continue. "Do you need blood?" was the question posed by a man in his 30s, sporting a crew cut and a black tote bag, whenever someone passed him in the hallway of a respected, Beijing military hospital in October. Shortages are commonplace in growing cities such as Beijing, Shanghai, Chengdu and Guangzhou. And the problem "is spreading across the entire country," said the director of Tianjin's Municipal Blood Center, Yang Wenling. Beijing's citywide stocks on November 26 held only about 10,000, 200-milliliter units of blood, officials say, which is only about half of what the city's hospitals need. To encourage Beijingers to donate, the Red Cross recently rolled out special policies offering preferential treatment to employees of companies and organizations that sponsor blood drives. Any of these employees who need blood would be first in line. These preferential policies underscore the severity of the blood shortages, which have deepened in recent years. Since October, official websites for health agencies in Inner Mongolia Autonomous Region and Zhejiang Province, for example, have been urging people to donate any type of blood. The central government's Ministry of Health says the amount of blood used in medical procedures across the country has increased up to 15 percent annually in recent years, far outpacing legal donations. Surgeries using blood rose more than 18 percent in 2010 over the previous year, but blood collections outside the illegal trade increased only 7.7 percent. 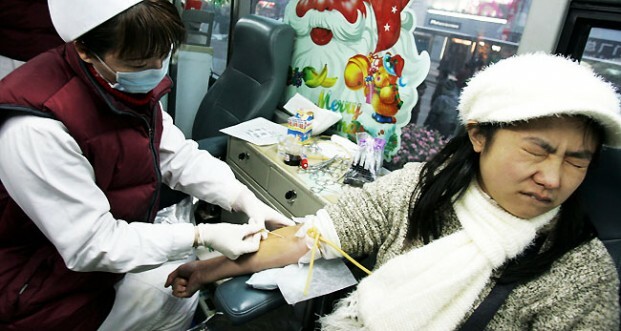 Under China's system, blood centers handle collections from voluntary donors. They're supposed to collect enough to meet the demands of hospitals and other health care facilities. If supplies from pro-bono donations fall short of needs, the national Blood Donation Law encourages patients to organize personal blood sourcing, perhaps by persuading family members, friends, coworkers and neighbors to donate blood through a so-called "mutual aid" project. Few hospitals in China provide personal collection and storage services for people who want to bank their own blood. Before 2011, mutual aid donations accounted for a small portion of all donations. Most sources were donors who rolled up their sleeves at Red Cross drives or on university campuses, and whose blood was processed, banked and distributed to hospitals on an as-needed basis. But over the past two years, mutual aid donations have skyrocketed. A doctor working at a military hospital told Caixin that "because of the blood shortage in Beijing, almost every operation in 2012 required a mutual aid donation." And the mutual aid system's loopholes are wide enough for plenty of illegal activity.